Groom Guide: Things A Bride *Secretly* Wants From You At The Wedding! 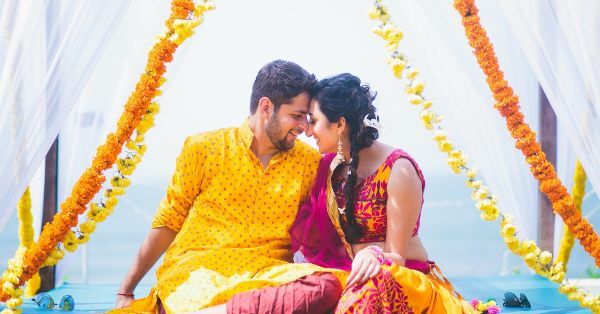 Apart from making sure that the baraat reaches on time for the wedding, there are a few other things that every bride secretly wants from her groom. Things that make her feel special and things she’ll remember and make her smile always. And if your mind isn’t working on ideas and things to surprise your to-be-wife with, we have a few things you could do to make her and everyone else around her go ‘awwww’. Co-ordinate with her bestie or sister and leave little love notes all around her room and house. You could even ask them to hand over notes to her throughout the day. For instance, a note when she wakes up telling her how beautiful she is, one reminding her to eat breakfast, another before she starts getting ready and so on. Instead of she getting her shoes personalised, you get it done for her! From an ‘I Do’ painted on the soles to your initials or just a short romantic quote, you can do so much to make those gorgeous pair of heels even more special and priceless for her. If you guys have a proposal video, play it on the big screen at the sangeet function! She’ll be totally surprised and re-living the moment just before the big day would be the perfect gift for her. The morning of the wedding is going to be stressful. To make sure she eats properly, surprise her by ordering her favourite breakfast to her bridal suite or her home. Now that guarantees you a lot of brownie points! Nothing better than penning down your emotions. Write her a letter expressing your feelings for her and how you cannot wait for her to become your wife. Have your nephew/niece deliver it to her moments before she enters the wedding venue. You could even compile old notes you both have sent each other and make a scrapbook for her. Poor girl would be going through a rollercoaster of emotions. Last minute ceremonies, make-up appointments and that sinking feeling of leaving her home… That’s too much to handle! Cheer her up throughout the day by sending her small gifts to calm her down and keep her smiling. If you couldn’t record your proposal video, surprise her by making a video of all your photos and memories together. Relive the fond memories you’ve both have spent together. Share it as a WhatsApp video if you’re the shy kinds or just have it played on the big wide screen! Put all your favourite pictures in this Love Photo Frame (INR 349) and decorate your room. Make a playlist of all her favourite songs along with those numbers that you both as a couple have fond memories off. Surprise her by playing this playlist at one of the functions. It could even be a great idea to share your first dance on this playlist. Write your own wedding vows for your beautiful bride. There is nothing sweeter and more romantic than this. Send this “I am Hooked Cushion” (INR 299) to her and let her know how happy you feel to be hooked and booked by her. There is nothing more comforting than knowing that your husband-to-be respects and cares for your family. Leave notes for her family members and thank them for trusting you with their daughter and for accepting you as their son.